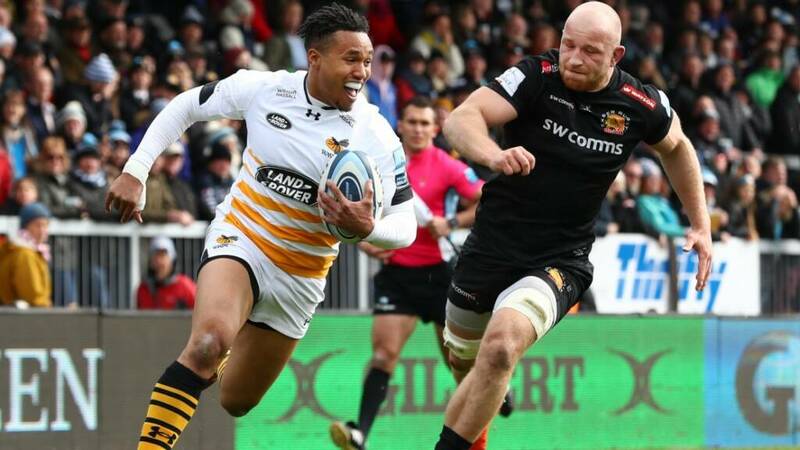 Wasps claimed a first-ever league win at Sandy Park on Sunday to climb to fifth and end Exeter Chiefs’ impressive home record. The Chiefs have already secured a home semi-final and, despite a fast start, were caught out by a fired up Wasps. Dai Young’s side have now won two from two after a four-game losing run and are still in with a shout of the top four. Nathan Hughes may not have crossed for a try but the No.8 was the key to everything Wasps did well. He created their second try for Juan de Jongh with a break and offload, then set up Marcus Watson’s with a deft kick and was involved in the build-up to Zurabi Zhvania’s bonus-point score. Quick thinking and a probing kick from Nathan Hughes and Marcus Watson pounces for his sixth Try of the campaign. He may be off to Bristol next season, but he clearly wants to finish this campaign on a high. Hughes and Gaby Lovobalavu combined beautifully down the right with Zurabi Zhvania for Wasps’ fourth try of the afternoon. The prop was the beneficiary in the end, slamming down from Lovobalavu’s final offload for Wasps’ fourth try that secured a bonus-point win. Wasps scored four tries in attack, but their final defensive stand to hold off the Chiefs and secure victory was the stand-out moment of an epic clash. The back row of Hughes, Brad Shields and Nizaam Carr led by example along with skipper Joe Launchbury as the Chiefs ran out of ideas and Wasps survived. Wasps No.8 Nathan Hughes: “We have had some hard tough games this season and it was good to come to Sandy Park and put it right. “It was a great performance all over the board, the forwards stood up to the Exeter pack. “Exeter are a great outfit and credit to our boys, we stood up to the challenge and came away with five points. “I want to leave on a high. The club has given me a lot of opportunities, opened doors for me and I just want to pay them back. “To leave them on a high with a great finish to the season would be great. Exeter Chiefs director of rugby Rob Baxter: “Fair play to Wasps. They are a dangerous counter attacking side and they capitalised on that particularly in the first half. Gameweek 1️⃣9️⃣ in the books, 3️⃣ rounds remaining. Here’s how the table looks.